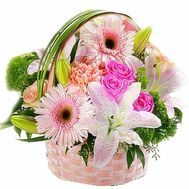 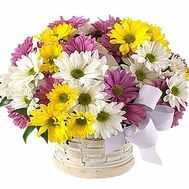 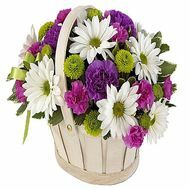 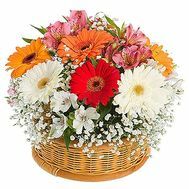 Baskets with flowers are unusual flower combinations that you will rarely find anywhere else. 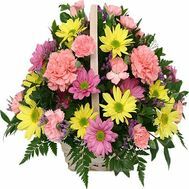 The fascination of mixes from colors is just in a variety of varieties and forms, which makes the gift more vivid and original. 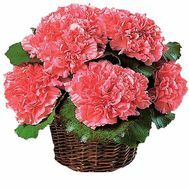 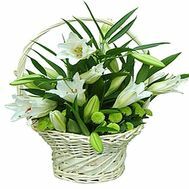 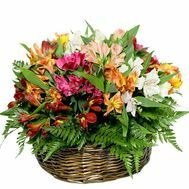 In addition, you will not have to worry about anything: the delivery of a basket of flowers is carried out by real professionals! 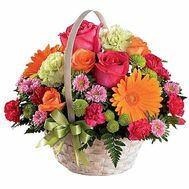 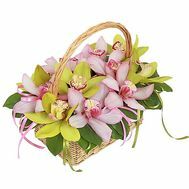 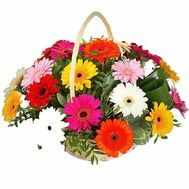 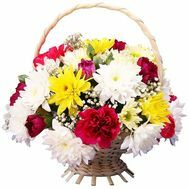 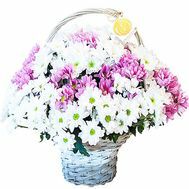 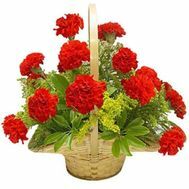 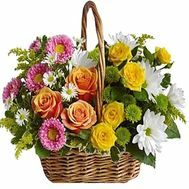 A bright flower basket with home delivery is the kind of gift that will never become obsolete. 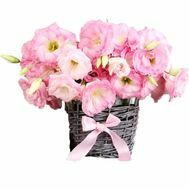 Beautiful, elegant, in its own beautiful, it attracts attention, creates coziness and truly French charm. 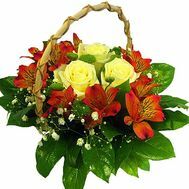 And in our store you can find a present for every taste and only with fresh flowers. 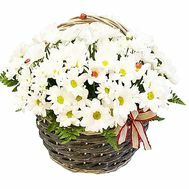 We pay attention to the little things, because all our baskets are decorated uniquely: each can be decorated with ribbons, beads, various floral decorations and many others, depending on your wishes. 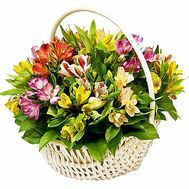 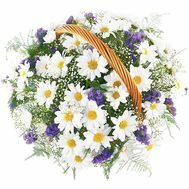 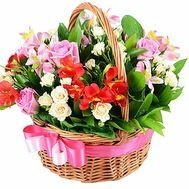 We also have a children's basket of flowers, made by the best, experienced florists of Ukraine. 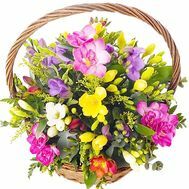 Bright, colorful and lush, it is suitable for decorating the baby's room or to present it on the Day of Nicholas as the main gift. 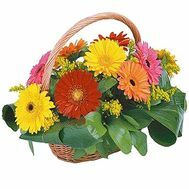 But the use of a basket of fresh flowers is not limited to this! 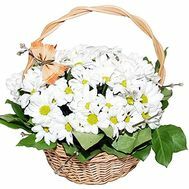 Small baskets of flowers will be excellent helpers on a date in view of the ease and simplicity of their transportation. 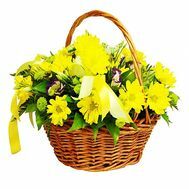 Just imagine the surprised and envious glances of all around when your woman will be pacing in the park, holding a beautiful basket of bright colors. 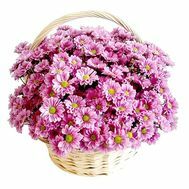 In summer you can also buy a basket of wildflowers - gentle, timid ones, which stretch their petals to the recipient. 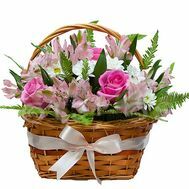 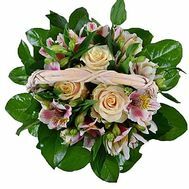 And for big aesthetes and lovers of beauty in our store there is always a basket of roses - fanciful, elegant, designed specifically for special occasions in life. 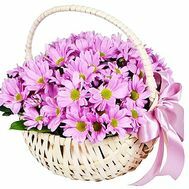 If you choose a gift for a child - remember: order a flower basket to the baby with the delivery - the best that you can do as a parent for his holiday! 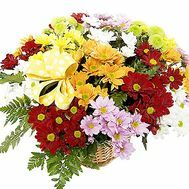 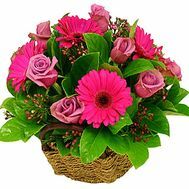 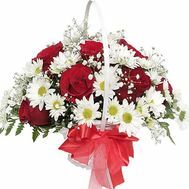 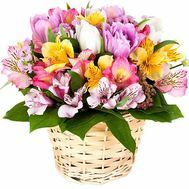 Delivery of flowers of the best quality: surprise loved ones without leaving home! 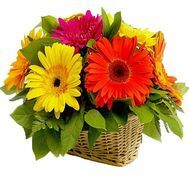 Having more than 10 years of experience, we are engaged in professional express delivery of happiness and joy at home. 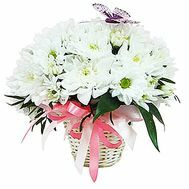 Our delivery service provides not only free delivery in large cities, but also a 100% quality guarantee, thanks to which all flowers come to customers in the best possible way. 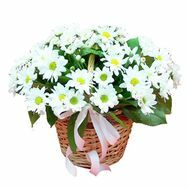 About all this and many other things you can read in the reviews about our work, as well as personally you can see the photos of the already delivered deliveries from our store. 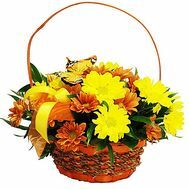 Here you can buy baskets with different colors, as well as take part in various promotions. 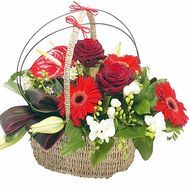 We arrange delivery by courier, which means that we will bring the gift straight home and hand in hand. 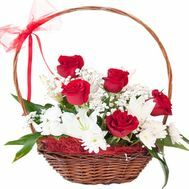 Also we can add a gift to a bouquet from our assortment to your taste. 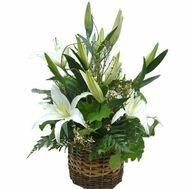 To order a small basket of flowers means to present not only an unusual present, but also to impress with fresh ideas on its design!